Nearly five years ago, in October 2010, work began on the Sheppard East light rail transit project, the first of three Transit City lines funded by the provincial government. This initial work was to build a grade separation between Sheppard Avenue East and Canadian National Railway’s Uxbridge Subdivision (better known as the GO Transit Stouffville Line), adjacent to the Agincourt GO Station. Metrolinx was still undertaking detailed design work for the connection to the Sheppard Subway at Don Mills Station, as well as the carhouse at Sheppard and Conlins Road, which would have also served the planned Scarborough RT replacement and extension and potentially the Scarborough-Malvern LRT, one of several Transit City lines that weren’t funded. Originally, the 13-kilometre Sheppard East line was to be the first to open, originally by the end of 2013. 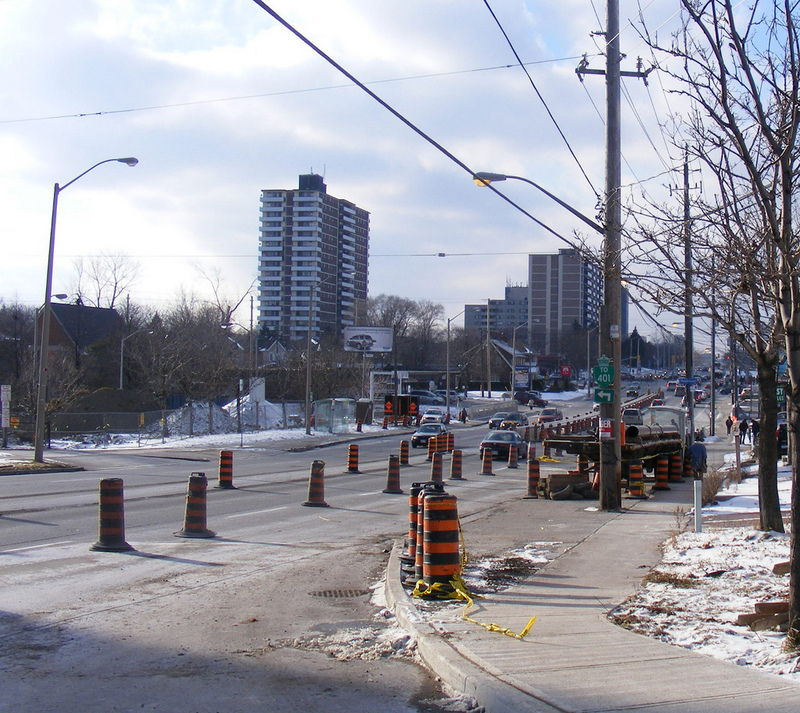 Finch West between Yonge Street and Humber College was to have opened by the end of 2015. But thanks to austerity measures enacted by the province in Spring 2010, the timelines were pushed back: the Sheppard Line would have opened in 2014; a shortened Finch line (only between the Spadina Subway extension at Keele Street and Humber College) in 2019. The completed Sheppard Avenue underpass at Agincourt GO Station, 2013. Note the median for light rail. Image via Google Street View. Construction was completed on the Agincourt underpass in May 2013, yet all other enabling work for Sheppard was halted after Mayor Rob Ford’s election. The incoming mayor declared Transit City dead; the province, up for re-election in 2011, was eager to oblige. Ford mused about extending the Sheppard Subway line west to Downsview and east to Scarborough Town Centre, and extend the Bloor-Danforth subway line instead of go with the fully funded, fully approved LRT replacement and extension. Ford was aided and abetted by councillors on both the right and the left, with Councillor Glenn De Baeremaeker the most prominent of Ford’s subway enablers. It’s almost a miracle that the Eglinton-Crosstown LRT project survived Ford’s bull-in-a-china-shop act. After some uncertainty, major work on that line continued, with the first boring machines launched in June 2013. That didn’t stop Ford from promising to bury the surface section of the route, at a cost of $1 billion, a plan that City Council defeated in February 2012. In March 2012, Council again voted to construct the Sheppard East LRT, in a 24-19 vote against Mayor Ford. Yet work never re-started. In October, 2013, Council voted to proceed with the extension of the Bloor-Danforth subway, even as Ford was losing control of the agenda overall. The provincial Liberal government again went along, hoping to retain power, perhaps even win back a majority government, in the next election. Even Adam Giambrone, an architect of the Transit City LRT plan, backed the expensive subway option as a NDP candidate in a Scarborough provincial by-election. That decision pretty much sealed the fate for the Sheppard East LRT. Why go back to building a light rail line on Sheppard if council couldn’t commit to building the Scarborough RT replacement? Why bother building an expensive maintenance facility to serve only one line? Why put any political capital in a project that had only tepid political support? After all, Scarborough was getting the subway extension most of its politicians demanded (even if its residents preferred an LRT), and there would be SmartTrack. Sheppard East was all but dead. A few weeks ago, the provincial government re-confirmed that it was funding the construction of the $1.2-billion Finch West LRT between Finch on the Spadina Subway extension, and Humber College, but that work would only start in 2016, and open five years later, in 2021. It also announced 2021 as the start date for construction on the Sheppard East LRT. That puts that project into never-never land. And not a word of protest from City Hall. Why do we let politicians plan and then then destroy Toronto’s transit plans? Toronto is committed to spending billions on a subway extension we don’t need, while the subway we do need, the Downtown Relief Line, loses momentum as attention is focused elsewhere; on Sheppard and on John Tory’s dubious SmartTrack proposal, a plan that appeared almost out of nowhere in the middle of an election campaign, a half-baked plan that doesn’t provide the subway connectivity nor the redundancy required to function as an adequate relief line. Tory backed the Bloor-Danforth subway extension, even though the cheaper LRT plan was still open. Furthermore, Tory committed himself to the Gardiner East “hybrid” solution, which pretty much is a reconstruction of the existing elevated expressway east of Jarvis Street despite it being the more expensive short and long term option for a segment of road that is currently underutilized. It’s a plan that most urban experts and advocates dismiss, even warning that Toronto would be “a laughingstock” if it were implemented. Matt Elliott writes about this absurdity in more detail. To me, it appears that Tory surrounded himself with a small group of advisers like campaign chair and lobbyist John Duffy (who will be leading a public relations campaign for SmartTrack) and transportation adviser Eric Miller (who co-authored the pre-SmartTrack reports and whose University of Toronto Transportation Research Institute developed the case for the “hybrid” option backed by “The Gardiner Coalition”). Maybe council will overrule Tory’s preference for the “hybrid.” Maybe not. And because of that, John Tory is proving to be on the wrong side again and again on important issues; from carding, a racist police practice he seems to have no problem continuing, despite increasing public opposition; to limiting necessary tax increases; backing the Sheppard Subway; maintaining the East Gardiner Expressway; his stubborn support for SmartTrack. I’m reminded of his myopic and stubborn support for religious school funding as Ontario Progressive Conservative leader back in 2007; a platform that might have cost him the election. I hope to be proven wrong, but I can’t say I have much faith in John Tory’s leadership. Of course, politicians of all stripes can be blamed for the Scarborough Subway Shitshow. But I feel we blew the last, best chance to get things right. This entry was posted in Politics, Toronto, Transit and tagged John Tory, Scarborough, Transit. Bookmark the permalink. Sean, as the subject of a future blog, may I suggest that you compare Tory’s positions and voting record on key issues to Rob Ford’s. My guess is that they won’t be that different, even though Tory is capable of providing slicker rationales for his decisions.